Where do I begin? It's almost been a year since I last blogged. I am a busy girl, but that is really no excuse for not keeping you guys updated. I have received a lot of feedback and emails wondering about my blog and lack of updates. Well it's 2011 and it's going to be different this year. Now where to begin, I am going to try and give a short recap on what has happened in the last 9 months. 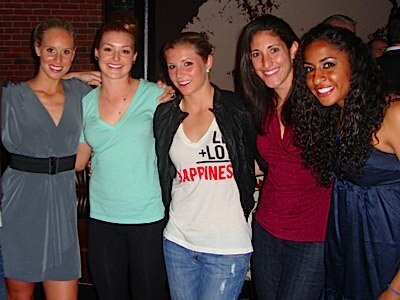 The 2010 WPS season as a Boston Breaker was a huge success, both on and off the field. I was very lucky to be part of an awesome organization with great coaches, owners and teammates. We started off the season with an average record and actually at one point were struggling scoring goals and winning games. The month of June was very interesting to say the least. I was feeling great and soon after I was in the hospital having surgery. We still don't know, but somehow I got an infection in my leg, had surgery and was out for the whole month of June. I felt terrible being a co captain and not being able to help my team on the field. I just rehabbed, stayed patient, positive and did whatever I could to help our team get back on track. While this was happening the Breakers decided to make some changes to our team. Two of these players were very good friends of mine and it was hard to see them go. We had seen it happen with the LA Sol last season but no one expected a team to fold in the first half of the season. The ST. Louis Athletica came to an end and as a result my best friend Lindsay Tarpley came to play for the Breakers. Let's just say it was amazing living and playing in the same city as her. We ended up turning our season around and were on fire, going 10 games without a loss. We clicked, bonded and accepted we were in this together. I love that feeling when everyone is invested and you play as a team. August 15th, in the 92nd minute vs Sky Blue at home, I experienced a surreal moment. I went into shock, I broke my collarbone and that was it for me. I knew it, I hadn't passed out before from pain and that noise I will never forget. After 17 years playing soccer, it was my first broken bone. I am a lucky girl. I knew that it could have been so much worse, I had to remind myself to keep things in perspective. I had gone through many injuries since 2008 Olympics, but this one hurt it really hurt. I didn't want to talk to anyone or see anyone, I needed some time. I couldn't understand how and why it happened to me. I worked so hard to be fit, healthy, confident and help the team be successful. It took me 4 days, then I was back. From the rest of the season on, I was again on the sidelines doing whatever I could to help the team stay successful. We had a fantastic season and were very unlucky to lose in the WPS semis on a questionable hand ball call in the box. I was so proud to be part of the team. We won, we lost and we did a lot of things together. It was a very memorable season for everyone involved. Our loyal and dedicated fans, thank you for all the support along the way. We are going to do our best to win the 2011 was championship! And THANK YOU to our owners, for letting us live out our dream!